Imagine your child’s face when they walk into your room, after playing at the Disney Parks, to find a special gift, just for them! When you book with Destinations in Florida (A Division of Destinations to Explore) you will receive a special in-room gift called the Mickey Kool Snack. 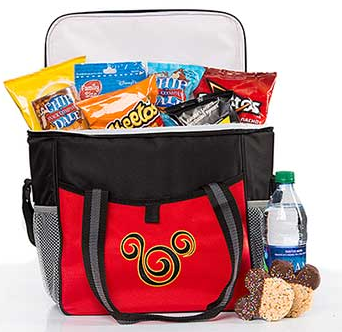 This fun cooler is packed with sweet and salty goodies to enjoy now and will be a great reminder of your Disney vacation after your return home. This gift will be delivered to your Disney Resort room during your Disney World vacation. This gift is free to our customers who book a Disney World Package valued at $3,000 or more with at least 3 nights at a Disney Resort and 3-Day Tickets.